The commissioner in his statement, said that individuals that are of high risk of getting infected are health workers, families or friends of an infected person who could be infected in the course of feeding, holding and caring for them. 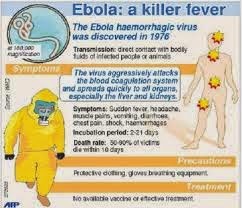 He gave measures to avoid being infected to include; washing of hands often with soap and water, avoiding close contact with people who are sick and ensuring that objects used by the sick are decontaminated and properly disposed. He also advised that any suspected case should be immediately reported to the state's Ministry of Health or any Local Government.